Today, we take a look at the Air Jordan IX as we continue the Jordan XX8 Days Of Flight. 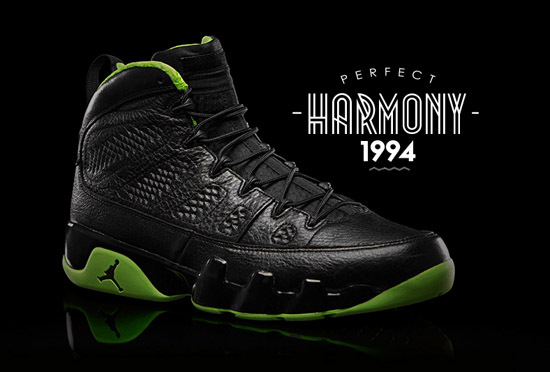 "The Japanese-inspired Air Jordan IX offered supreme comfort with an inner bootie and a speed lacing system. Words describing MJ were incorporated into the traction pattern using languages from around the world. Time to rock your AJ IX for Day 9 of XX8 Days Of Flight. www.AJXX8.com"
In 2002, the Air Jordan 9 Retro was released for the first time since it's original 1994 debut. After that, we saw the Air Jordan 9 Retro return in 2008, 2010 and 2012. To date all original colorways have been retroed however, people still love the Air Jordan IX even nineteen years later. No new Air Jordan 9 Retro's are set to release in 2013 however that does not mean they will not release. If information becomes available and the Air Jordan 9 Retro does return this year, I will be sure to update everyone. Stay tuned to the 2013 Release Dates section for all your Jordan Brand 2013 release information. For now, enjoy the images below of this sample black and volt green colorway of the Air Jordan IX made exclusively to celebrate the Jordan XX8 Days Of Flight Collection. Be sure to check out my Twitter @ajordanxi and Instagram @ajordanxi as I have submitted pictures of some of my Air Jordan IX collection to share with everyone. You can also see them on the ajordanxi.com official Facebook page here as well.